Despite the common name, lime trees (of the genus Tilia) are not related to the citrus fruit we know as a lime. All European species of Tilia are interfertile, meaning they can breed with each other, and natural hybrids are common, leading to difficulties in their identification. Large-leaved lime is one of the parents of the natural hybrid Tilia × europaea, which is widely cultivated and used as a street tree. Lime trees have fragrant flowers that are visited by bees. A giant among European trees, large-leaved lime can grow up to 35 m tall. Tilia platyphyllos is native to central and southern Europe (including Great Britain, where it is possibly only native in woods on calcareous soils). It is also frequently planted in parks and gardens. 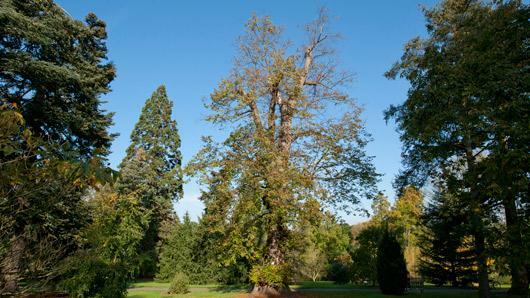 Overview: Large-leaved lime trees grow up to 35 m tall, with grey, finely fissured or ribbed bark. The young twigs are hairy. 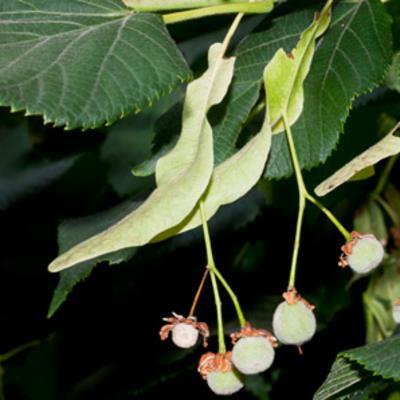 Leaves: Leaves are usually 6-12 cm long and hairy on the underside, especially on the veins, and have a sharply toothed margin and heart-shaped base. Flowers: Flowers are fragrant, borne in groups of 2-6, and bisexual, with five free sepals and five free, yellowish petals. Each flower has numerous stamens (male parts) that are more or less fused into five bundles. Each ovary has five compartments, each of which contains two ovules. Each flower has a single, hairless style (female part). Fruits: The fruit is a strongly ribbed nut containing 1-3 seeds. Large-leaved lime is cultivated as an ornamental in parks and gardens, although not as commonly as Tilia × europaea (common lime). Lime wood is pale and soft and cuts cleanly; it has been used by wood-carvers since the Middle Ages. The wood is strong but prone to decay when damp, so has limited use as a building material. Young leaves can be eaten as salad, and flowers have long been used in continental Europe to make a tea believed to have a calming effect. Lime flower tea is also used widely to ease coughs. Lime flowers are a rich source of nectar and attract bees, wasps, flies and moths. 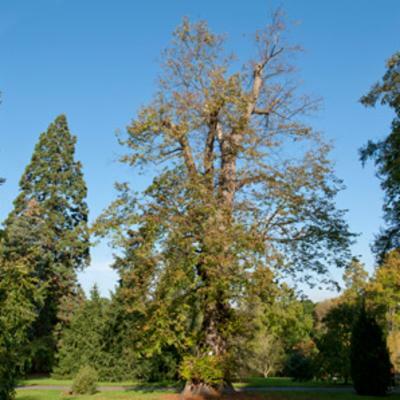 Stored seeds of Tilia platyphyllos behave in an orthodox manner (meaning the seeds will survive the drying and freezing process), and two collections are held in Kew's Millennium Seed Bank based at Wakehurst in West Sussex. Many cultivated forms and cultivars have arisen from Tilia platyphyllos but few are available commercially. 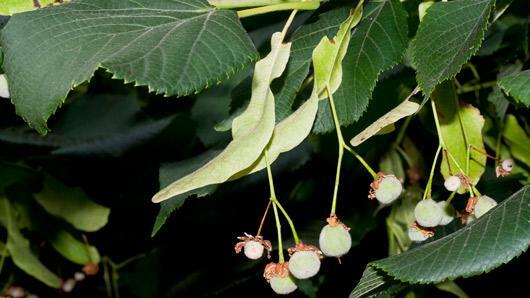 Tilia platyphyllos 'Pendula' has spreading branches and pendant (hanging) branchlets. Tilia platyphyllos 'Rubra' has reddish twigs in winter and has been given an Award of Garden Merit (AGM) by the Royal Horticultural Society. Kew has one of the main collections of lime trees ( Tilia sp.) in Europe. Large-leaved lime can be seen growing in the area between Kew's Temperate House and Victoria Gate. Pressed and dried specimens of Tilia platyphyllos are held in Kew's Herbarium, where they are available to researchers by appointment. 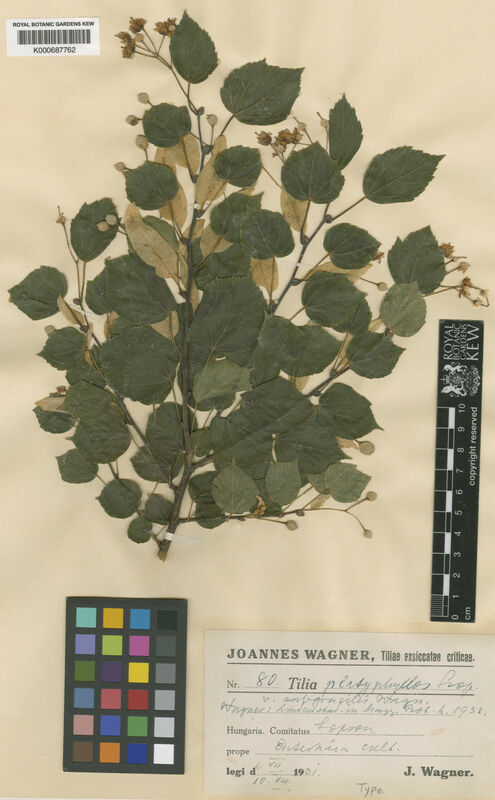 The details of some of these, including images, can be seen online in the Herbarium Catalogue. Specimens of the wood and bark of large-leaved lime are held in Kew's Economic Botany Collection in the Sir Joseph Banks Building, where they are available to researchers by appointment. Tilia collivaga Heinr.Braun ex V.Engl. Tilia cucullata Jacq. ex V.Engl. Tilia rubra var. praecox (Host) V.Engl. World Checklist of Selected Plant Families (2012). Tilia platyphyllos. Published on the Internet by the Board of Trustees of the Royal Botanic Gardens, Kew. Pigott, D. (2005). Lime. Sage Press, East Sussex. Mabey, R. (1997). Flora Britannica. Chatto & Windus, London. Muir, N. (1984). A Survey of the Genus Tilia. The Plantsman 5: 234. Bean, W. J. (1980). Trees and Shrubs Hardy in the British Isles, Volume IV (Ri-Z). John Murray, London.